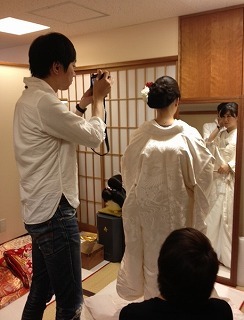 For the first fitting, she chose “Shiromuku (all white kimono)”. The groom-to-be was like a photographer. The groom-to-be devoted himself to taking the photos. At this event, you can also try the Western style hair arrange. It seemed that she enjoyed this event very much. 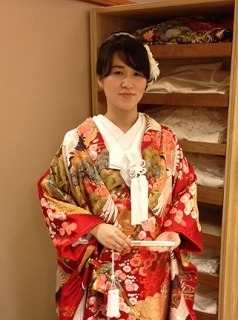 On August 2nd, We held a trial fitting event of Japanese kimonos and wigs at our Tokyo branch. This event is always quite popular and it was booked out with lots of participants this time as well. 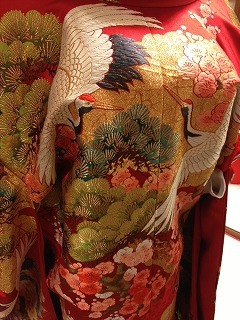 All the kimonos prepared for the event were with high quality and they could be worn at the real wedding ceremony. The Iro-Uchikake with the embroidery of auspicious motives such as “MATSU (pine tree)” “UME (plum)” and “TSURU (crane)” was really gorgeous and beautiful. This event was also a rare opportunity that you could consult directly with our staff who is in charge of the make up and the costumes in Kyoto. After getting answers to the questions, they could have clearer image of their ideal wedding ceremony. And they must be really looking forward to it. We were very happy to see that they enjoyed the event very much. And we, the planners, could share the good time with our guests as well. Thank you very much for those who participated the event.